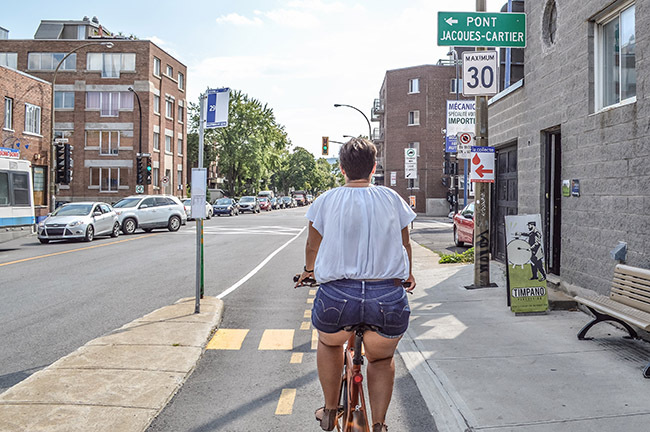 When it comes to normalizing the act of getting on a bicycle, we at Modacity have long held up Montréal as a shining example, arguing that active transportation leaders in Vancouver could learn a thing (or eight) from them. 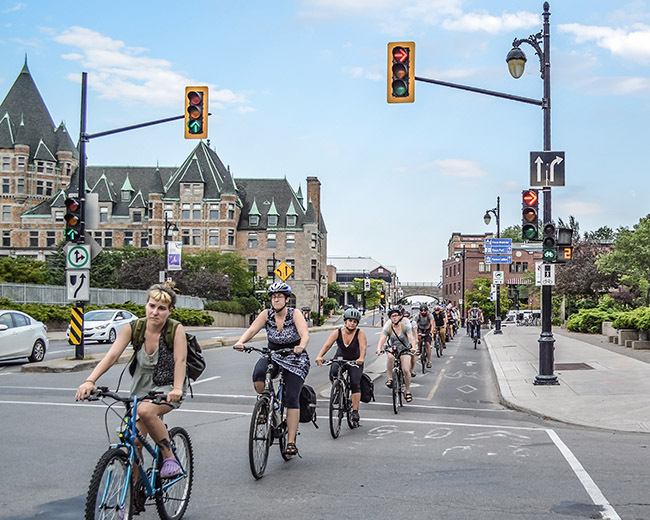 Montréal was the one and only Canadian entry in the top 20 of the 2015 Copenhagenize Index, a biennial list of the world’s most bike-friendly cities. Vancouver placed a disappointing 46th. 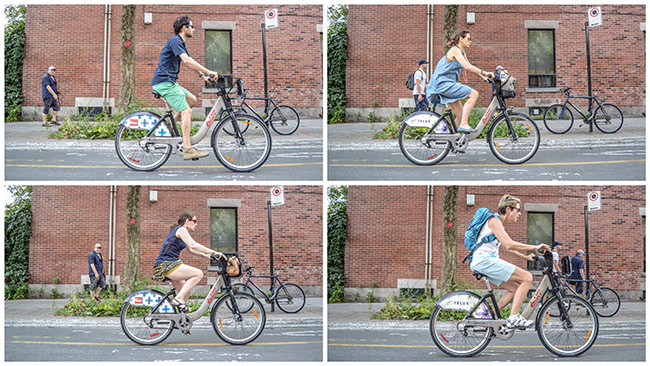 We make a point of frequently visiting Montréal, and always leave with one significant impression – to them, riding a bicycle is just an extension of the way people get around. Culturally, it is not regarded as a ‘fringe’ activity, as it is on the West Coast, which likely explains why so many Montréalers are comfortable doing it. 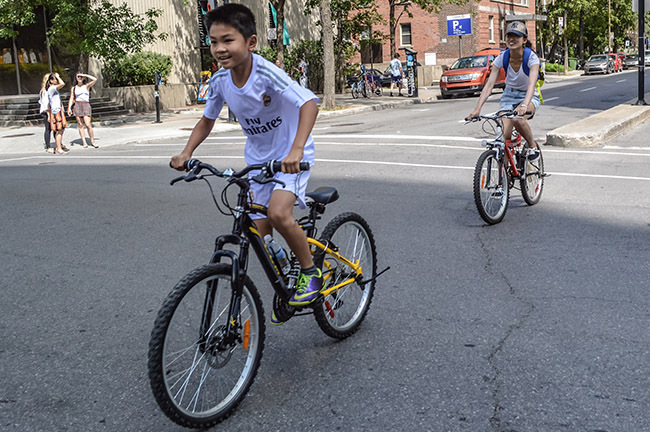 We are in the midst of a thoroughly enjoyable couple of days pedalling around Montréal with our children, and wanted to revisit – via words and photographs –what it is that makes theirs a bicycle culture worth bragging to the world about. Inspired by a trip to Amsterdam and a visionary traffic engineer, Montréal quietly built the country’s first on-street protected bike lane 30 years ago, and haven’t looked back since. They now lay claim to the oldest and largest network of segregated bike lanes in North America: 342 kilometres, 73 of which are on street. 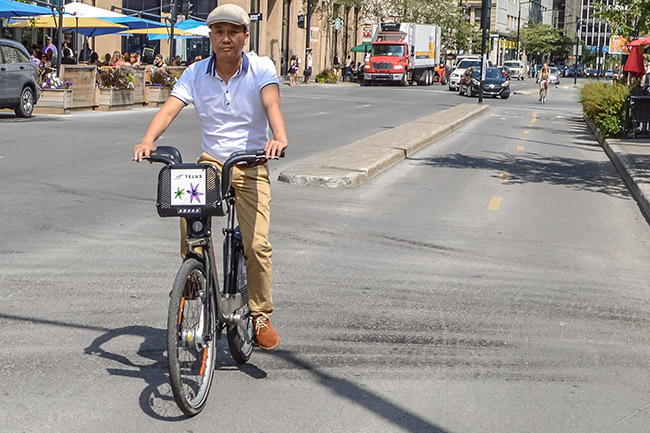 Montréal also boasts one of the continent’s first bike-share systems, Bixi, which opened in 2008 and quickly became an indispensable part of their culture and transit system. With over 5,000 bikes, 400 stations, and an average of 25,000 trips per day, it is the second biggest bike-share in North America, after New York City. Despite studying the issue for many years, Quebec politicians have resisted the urge to mandate bike helmets for both children and adults, realizing the negative health impacts of such legislation, and the affect on ridership rates and the viability of bikeshare programs. Subsequent studies have found the rates of head injury in Quebec are no different than British Columbia, where helmets are required for cyclists of all ages. Plateau Mont-Royal Mayor Luc Ferrandez made headlines in 2014 when he announced his borough would be reducing all speed limits (to 40 km/hr. on main arteries and 30 km/hr. on all other streets). 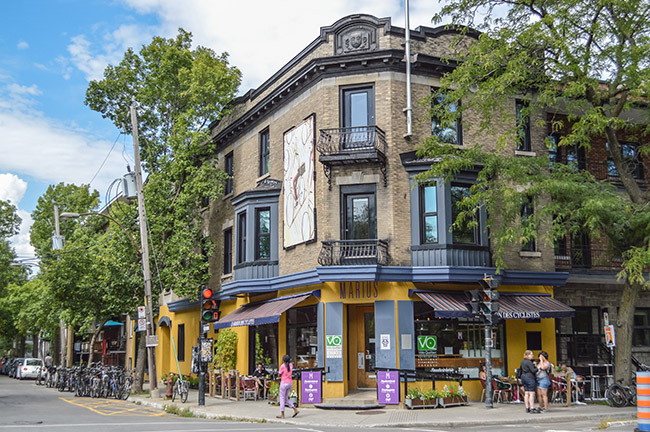 These initiatives were part of a larger plan make the Plateau more bike-friendly, in an area that has one of the lowest rates of car ownership (0.6 per household) and highest bike mode shares (9%) in Canada. When driving across the Saint Lawrence River onto the island of Montréal, you will likely spot a familiar sign (en français, bien sûr) by the side of the road. For over a decade, the island of Montréal has been the only place in Canada where turning right on red is against the law. It remains contentious amongst drivers, but any time spent walking or cycling in the city reinforces how much safer the ban makes you feel. Founded in 1967, Vélo Québec is Canada’s largest bicycle advocacy organization. They boast 4,500 members, a full-time staff of 80 (with another 40 seasonal employees), and four different divisions that advocate for better infrastructure, manage safe routes to school programs, and promote cycling through four unique magazines. Along with all of this, they also organize and a number of open street events throughout the year. 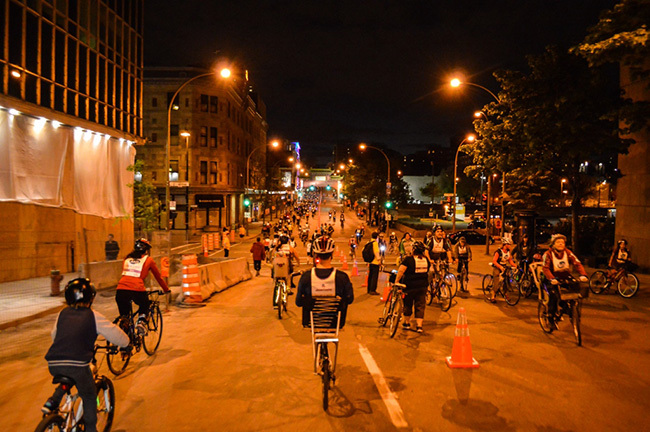 A central part of Vélo Québec’s uptake strategy is through events such as the Tour la Nuit, which, for one night a year, open the streets of Montréal to 20,000 cyclists of all shapes, sizes, ages, and abilities for a leisurely ride, conversation with friends and family, and a rare opportunity to see their city’s streets in an entirely different light. When the results of the Copenhagenize Index made their way to his office, Montréal Mayor Denis Coderre was absolutely livid, insisting they deserved an even higher ranking. 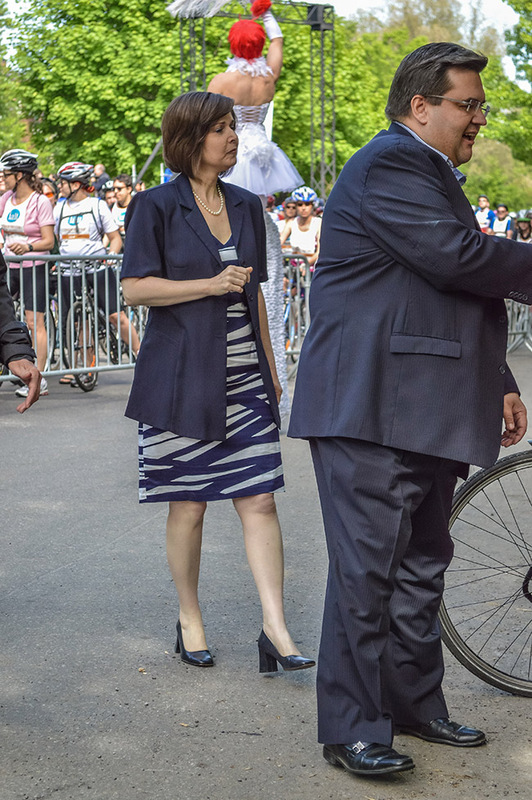 Later that same week, he proceeded to announce $12.5 million in funding for 52 new bike infrastructure projects. One thing’s for certain: with a leader so committed to perfection, we have no doubt Montréal is headed in the right direction. Inversely, Vancouver’s failure to crack the top 20 was entirely justifiable and unsurprising, in part due to how the news was met with indifference from our own press, politicians, and advocates. City staff have announced just two cycling projects thus far in 2015, both of which are relatively minor upgrades to existing routes, and a successful bike-share remains a pipe dream until someone takes a stance on the province’s hard-headed helmet law. Indeed, Vancouver has much to learn from Montréal’s cycling successes. Let’s hope we’re as dedicated to progress as they are. To view the full collection of photographs taken by the authors, please click here.